Many shoppers choose to do a lot of homework before making a large purchase like buying a new car. We also know that people who are looking at the 2016 Ford Flex may also be checking out the 2016 Honda Pilot. Let’s see how they stack up! With its recent makeover, the Pilot joins the fray with other mainstream crossovers and now features a more aerodynamic shape. It certainly mimics its little brother, the CR-V. The Pilot also added a top-of-the-lineup Elite model with seating for seven instead of eight. On the other hand ,the Ford Flex looks like nothing else on the road today, especially with its classic, squared off design and distinctive features like the signature Ford grille, horizontal grooves on the side panels and available contrasting roof color combinations. It also offers an impressive wheel lineup. …what they have on their lot is what they have to offer; that’s it. 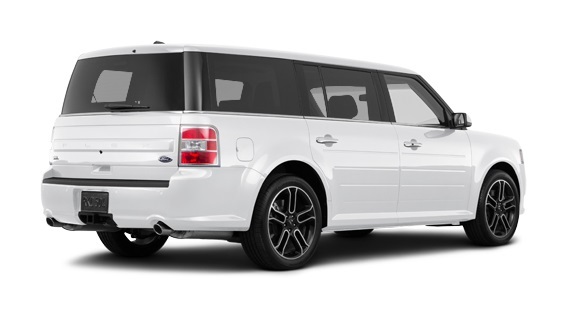 With the Ford Flex, in addition to awesome model selections and multiple body-color and roof combinations, Ford also offers the Flex Appearance Package! This package allows customers to take their style statement even further! 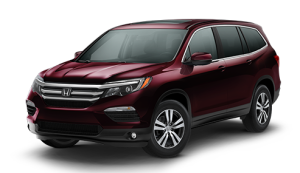 …the Honda Pilot only gives customers one choice of engines for all 2016 models. Where’s the choice in that? It’s a 3.5L V6 that produces 280 horsepower. 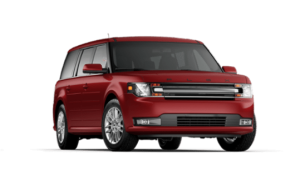 The base engine on the Ford Flex produces more horsepower than the Pilot. Flex also offers the optional 3.5L EcoBoost engine with even more horsepower. The Flex actually offers best-in-class V6 horsepower. …the 2016 Pilot is playing catch-up with its interior. Honda has added ore soft-touch materials and passenger room. However, the Flex instrument panel and console looks and feel like one solid piece. The cabin is also trimmed in soft-touch materials and there are refined accent touches throughout. The Honda Pilot is more spartan approach. The instrument panel and console area continues to have a variety of seams that make it looks pieced together. Models with the 9-speed transmission do get a push button gear selector in the center console. The Flex has best in class second row legroom AND best in class third row legroom. It also offers power-release auto-fold second row seats that fold the sea back down and lift the cushion out of the way. This provides easy access to the third row. The Pilot’s one-touch entry simply moves the second row seat forward and tilts the seat back forward. The Flex also offers the convenience of one-touch PowerFold-and-tumble third-row seats. The Pilot, well it doesn’t offer any type of power third row on any trim level! Let’s face it, the Ford Flex is just better! Flex also offered standard features like SYNC with MyFord (SE) SYNC3 (SEL/Limited). There’s also available adaptive cruise control and collision warning with brake support, BLIS with cross traffic alert and the Easy Fuel capless fuel filler. To be quite honest, the 2016 Ford Flex has a ton of awesome features not available on the 2016 Honda Pilot. You can certainly go take a look at one of them, but why waste your time over there? 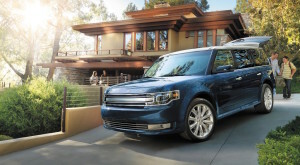 Stop by Beach Automotive first and save your time and money by taking home a 2016 Ford Flex today!